Yoga can be practiced by anyone, whether young, old, very old, healthy or sick. Even so, the way in which a young person is taught will differ in manner from the way in which an old or sick person will be taught. Therefore, each student must be considered as an individual and taught at a pace that is suitable for their situation in life. The format of the practice always remains the same; one always begins practice with Surya Namaskar, concludes with Padmasana and rest, and the various asanas gradually fill the space between these two poles. Learning yoga in this traditional manner benefits the student on many levels. It is possible for one to gain independence and confidence in their sadhana (spiritual practice), as well, something truly becomes one’s own when they learn it by heart. It is through the daily practice of Ashtanga Yoga that we draw it into ourselves, understand it, and become proficient in its methods, thereby reaping its wide range of benefits. For this to be accomplished, a slow, dedicated and patient approach is best. Vinyasa means careful linking of breath and movement. The Surya Namaskar and each of the successive asanas are comprised of a particular number of vinyasas. Vinyasa creates heat in the body, which warms the blood. The warmed blood passes through the muscles, nerves, internal organs and glands, removes toxins from them, and carries them out through the sweat. This is how the process of purification begins. It is important that the student does not rush ahead doing too many asanas, and allows the body to be gradually purified. If one rushes ahead quickly, it is possible for sickness to occur, rather than purification. It is important that the teacher checks to ensure that the position of the body and the movement of breath are correct in each asana before moving the student forward so that one may reap the proper benefit of Ashtanga Yoga. Because of the difficult nature of remembering and mastering the various vinyasas, on Fridays and Sundays, group guided classes are taught, in which all the vinyasas are counted out loud and all students follow along together accordingly. The method of Yoga taught at KPJAYI is that which has been told by the ancient Sage Vamana in his text called “Yoga Korunta.” Although many books on Yoga have been written, Vamana is the only one who has delineated a complete practical method. In the 1920’s, the Yogi and Sanskrit Scholar, T. Krishnamacharya traveled to Calcutta where he transcribed and recorded the Yoga Korunta, which was written on palm leaves and was in a bad state of decay, having been partially eaten by ants. Later, Krishnamacharya passed on these teachings to the late Pattabhi Jois, whose school continues to teach this method today. 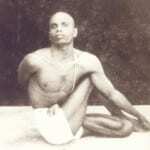 Vamana Rishi taught “Vina Vinyasa Yogena asanadih na karayet” – do not do yoga without Vinyasa. Vamana is telling one by one, and vinyasa, no problem.